Vet Students from Canada recently volunteered with Ayuda. This is a typical vaccination/treatment scene. It’s that time of year again! September is right around the corner and that means Ayuda volunteers will be hitting the streets, the plazas and “callejons” to provide annual rabies and combo vaccines for the many dogs and cats we track around Lake Atitlan. This year’s roster has well over 300 adults who need boosters and an undetermined number of new dogs, pups, cats and kits who will receive their first rounds. 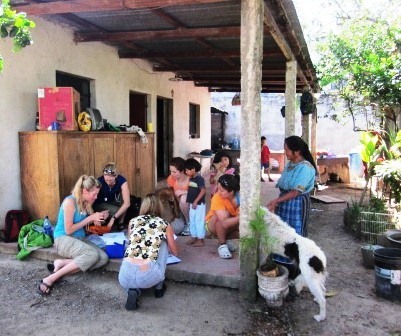 Ayuda works with the Centro de Salud (health department) offices in several villages. They provide us with free rabies vaccines along with official certificates and sometimes even syringes. This is a huge cost savings for Ayuda and we’re very grateful for their confidence and support. It’s the combo vaccines that must be purchased. While we have negotiated decent price breaks, we still have to raise the funds to buy them. Combo vaccines prevent diseases such as Distemper and Parvovirus, two huge canine killers that plague our region. For our kitty friends, the vaccines protect against feline viruses such as Rhinovirus and Feline Leukemia which is very similiar to human HIV. Ayuda volunteers all unanimously agree that combos should always be considered a critical part of our service package due to the high levels of these viruses in our region. It also seems to us that if we’re going to spend the time and resources sterilizing animals, we need to go the extra step and ensure their safety from preventable diseases. After all, Ayuda is all about the care and well-being of dogs and cats, not just the reduction of population. Our goal is to raise an additional $2000 solely for the purchase of combos. However, the more we raise, the more we can provide for newly discovered adults and youngsters. Please help us reach our goal to provide these life-saving vaccinations!